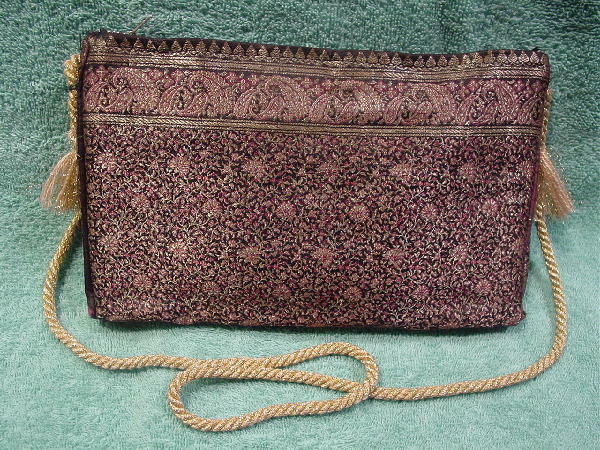 This custom-made vintage purse has a 41" long by 1/4" wide metallic gold cord shoulder strap with tassels in gold metallic and sand color strands at each end. It has a top side to side zipper opening which doesn't zip all the way because of the lining. 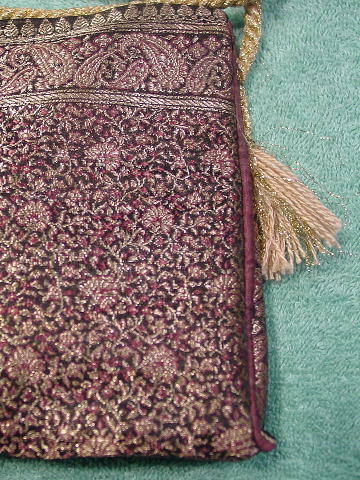 The exterior fabric has a black background with a thread design pattern of flowers, leaves, and paisleys in a gold and red-grape. The lining is in a purple-eggplant shiny, silky fabric. There is a large interior zippered compartment with a stiff backing on the pocket's back side. The interior bottom has a stiff backing 1 1/4" wide. The lining fabric edges the exterior ends. It's from a French actress. She had it made to wear to several parties on the French Riviera.